International colour authority Pantone has announced a "sociable and spirited" shade as the Colour of the Year for 2019. The company, which said it made the selection in "reaction to the onslaught of digital technology and social media" described PANTONE 16-1546 Living Coral as representing intimacy and the "need for optimism and joyful pursuits". 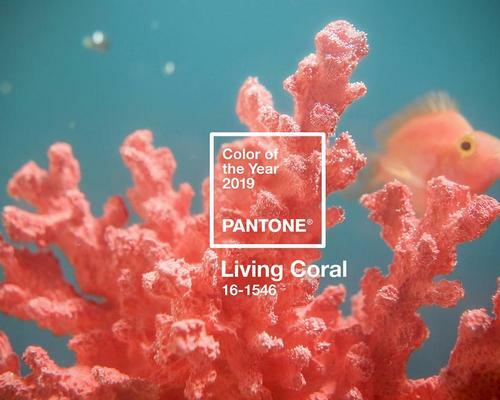 Commenting on the announcement, Leatrice Eiseman, executive director at the Pantone Color Institute, said: "Colour is an equalising lens through which we experience our natural and digital realities and this is particularly true for Living Coral. "With consumers craving human interaction and social connection, the humanising and heartening qualities displayed by the convivial Pantone Living Coral hit a responsive chord." Elaborating on the inspiration behind the hue, Pantone said it exudes the kaleidoscopic appearance of coral reefs and adds energy to modern life. Pantone has chosen a Colour of the Year for over two decades. To arrive at a decision each year, an in-house team of 'colour experts' and trend forecasters scour visual and emotional trends across a number of sectors, such as the design and entertainment industries. Last year’s winner was PANTONE 18-3838, a "blue-based purple" heavily utilised by musicians David Bowie and Prince.